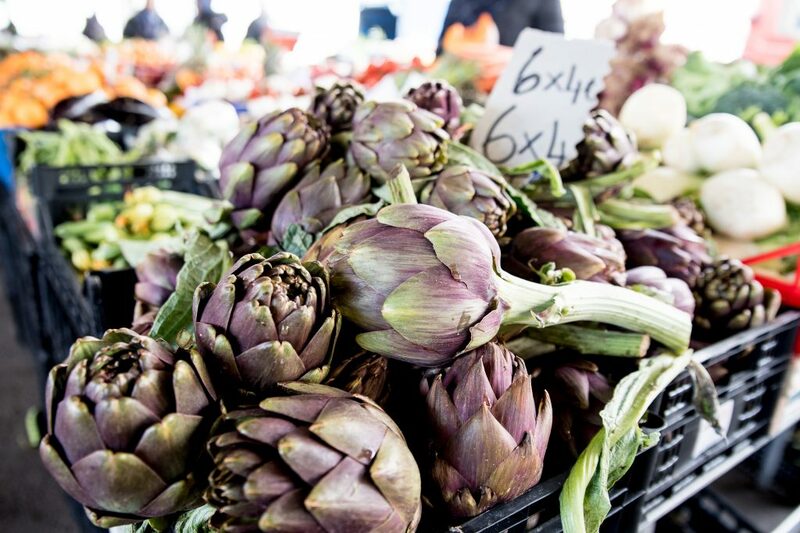 In Florence, artichokes may not have fascinating recipes steeped in deep cultural history like Rome’s, but they are nonetheless present and important to Florentine and Tuscan cuisine. They are commonly found in traditional trattorias quartered, battered and fried with a squeeze of lemon. 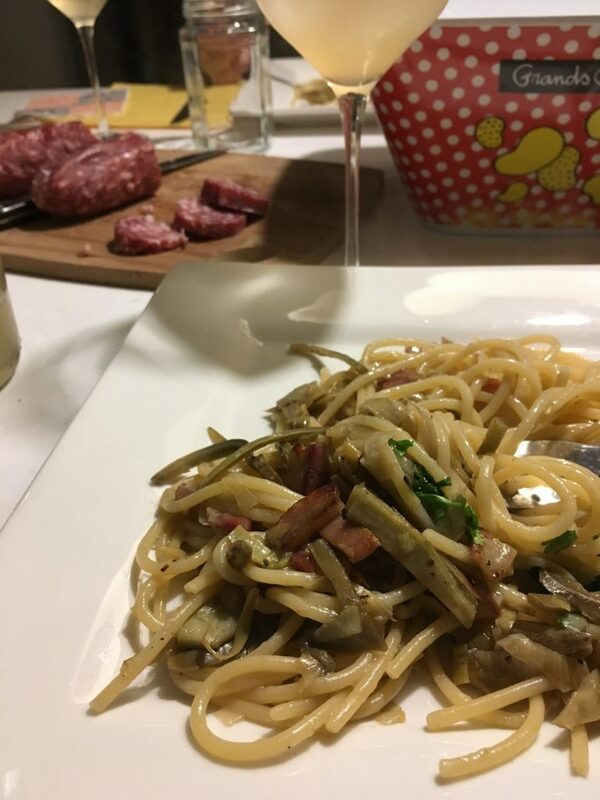 At home they are made into sughetti (sauces) for pasta, carciofi ritti (upright artichokes doused in lemon, herbs, pancetta and garlic) and are cooked along with a variety of meat dishes, such as involtini (meat-rolls), arrosta in crosta (crusted roast meats), etc. Artichokes in Italy start to pop up in January (starting from the south) and at least in Florence overflow the markets mostly in late winter/early Spring, and the season’s end depend on weather and where you are specifically in Italy. In Florence, they usually stick around till June but this year we had a frosty late February and chilly March and according to my grower/vendor at market, the season will be a month shorter than usual. If you are overwhelmed with Italian artichoke selection, there are a few ideas you can do at home. If abroad, you should still eat more artichokes as they hold a mecca of superfood powers. Artichokes belong to the thistle family and contain phyto compounds thought to have detoxifying effects on the liver, are high in fiber, beneficial to heart heath and blood sugar, reduce inflammation. Artichokes contain cynarin which is suggested to increase bile production, bile is responsible for ridding the body of excess cholesterol, digestion of fats and fat soluble vitamins. In Italy, a classic bitter spirit Cynar (name probably derived from the botanical name for artichokes cynara scolymus) based on artichoke extract is used as a substitute for Aperol or Campari for spritz drinks, and thus my excuse for drinking more spritz. When shopping for artichokes, there are a handful of varieties you’ll find from green globe (mammole), purple globe, spiny, Roman, and regional-specific varieties. In Florence, you tend to find the mammole (best for cooking) and the smaller spiny type which are either meant for crudo (raw, salads) or some which can double as both. It’s best to buy artichokes at the market and ask the grower/seller which ones are best for your intended culinary application: cooked or raw. For preparing artichokes, I found this post on cleaning and prep from Rome-based Elizabeth Minchilli extremely helpful. It makes you realize how insanely easy it is to prepare artichokes and you’ll get obsessed with making them all the time once you get the hang of it. My produce guy told me tomatoes can be used to acidulate water for keeping cleaned artichokes in place of lemon. I tried it- and it worked! At Ci.Bio, Fabio Picchi’s organic and artisan food market, their bread selection is tremendously nourishing and delicious. I suggest getting some of their rye bread, some fior di latte (cow milk) mozzarella from Sant’Ambrogio along with some sliced raw artichokes and drizzle again with balsamic. 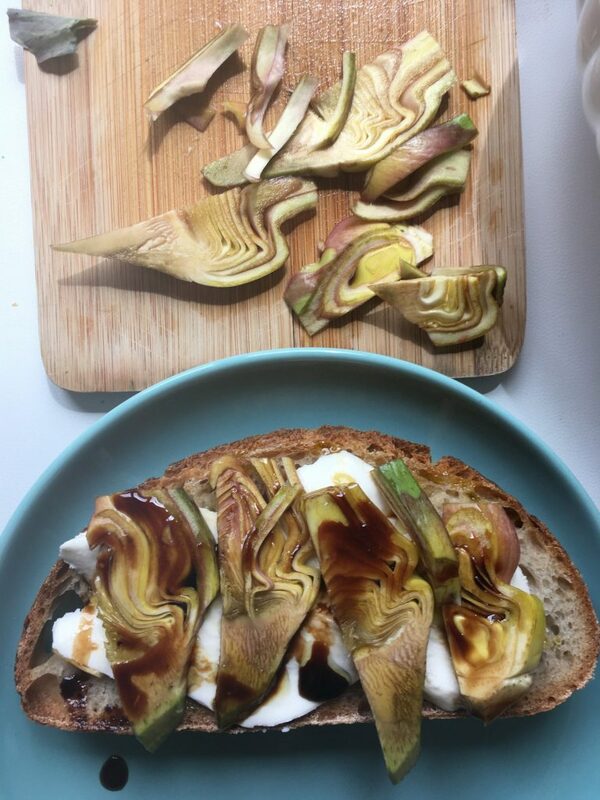 I didn’t toast this but you can, and even grill the artichokes if you have time/desire. I use quality aged balsamic from my food club for any tangy umami wishes:) Speaking of the food club, this season we include artichokes in the mailing along with a ricotta-based recipe. Info on Curious Appetite’s Florentine Gourmet Club here! Basically plate some sliced thin lonzino (cured pork loin), prepare raw artichokes sliced thinly, arrange and drizzle aged balsamic atop. SIMPLE! This is a little more complicated as a recipe, but I’ll do my best to simplify. Dice up some Tuscan rigatino (a type of Tuscan pancetta with more ripples of muscle less fat than traditional pancetta), brown in a large pan, add thinly sliced artichokes and their cleaned stems (3 if serving 4-6), add salt and fresh cracked pepper to taste, a cup of wine some water and simmer until soft, add a bit of warm pasta water intermittently to keep from drying/burning. 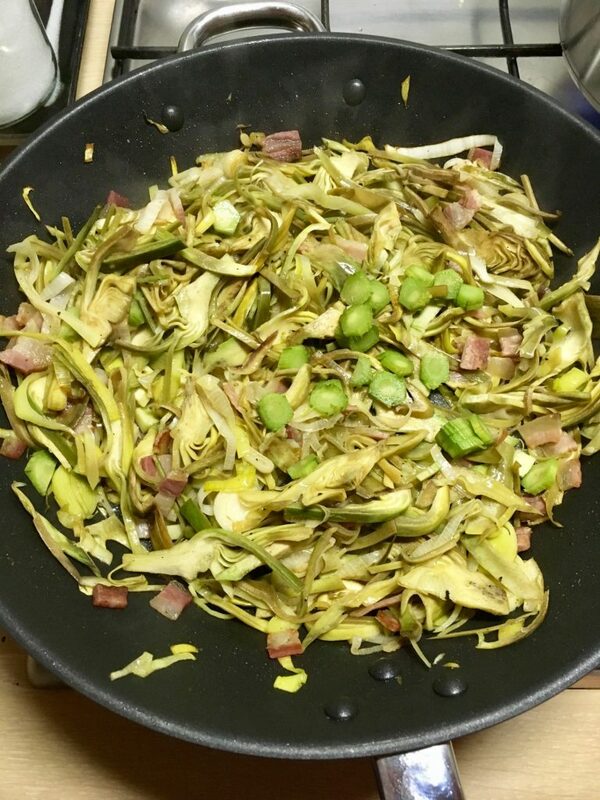 Any questions about this pasta recipe or any artichoke ideas to offer yourself?